Had this for dinner tonight and it was amazing! Made this for my picky eaters tonight……they LOVED it! Thanks so much! Made this tonight. It was awesome! The chicken was crispy and tender. I used spray olive oil, reduced fat parmesan, and homemade sauce . Serve over whole wheat pasta. I have just recently stumbled across your blog and I am thoroughly enjoying what you have to offer! I have been cooking from your recipe list for the past two weeks and I've been thrilled with the outcome of most of the dishes I've made. Even my very picky husband-to-be has been happy with everything 🙂 This dish is on my dinner list for tonight and I can't wait to see how it turns out! What if I want to use this for 2 people how much should I use of everything. I know this may be a dumb question but it's one I ALWAYS have when a recipe calls for butter. Do you use salted or unsalted? I never know and not a single recipe ever says. Gina, you are a God send! This was DELICIOUS! I modified the recipe slightly and used provolone cheese on top instead of mozzarella. I also breaded the chicken using whole wheat flour, egg, and bread crumbs instead of the butter. The baked version came out so much BETTER than pan-cooking it. I loved the crisp. I just made this for dinner tonight and it was delicious! Thanks for the recipe! I made this for dinner tonight and my husband and I loved it!!! It was super flavorful and the chicken stayed moist! So happy I tried it! We have plenty of leftovers as well! Had this for dinner tonight! SO GOOD! Will be making this again and again and again. THANK YOU!!! also a good sauce is tomatoes, olive oil, red pepper, salt. unwrap and use pasta maker to flatten and cut to desired size. I made this for dinner last night and it was very delicious!! I only had shredded mozz cheese so I used that and it was still very good..The chicken was a little dry- I think I might have kept it in the oven too long..Next time I make this I'll probably good 15 min then flip and measure with a meat thermometer to be sure. I'm making this for dinner tonight. Thanks for posting such delicious recipes! I made this tonight and it was awesome! Thank you for sharing your fantastic recipes. I love that you make most stuff from scratch and it makes me look great because everyone loves the food and thinks I'm a great cook when I really just know how to read and follow direction. making this right now! can't wait to try it! 🙂 made the chicken taco chilli last week, that was a hugeee winner! it was so good! tried this sometime last yr and it was delish…making it again tonight!!! O.M.G. This is SO, SO good!! Who would ever believe it is a "lite" meal! I used Perdue Perfect Portions chicken and served it over Ronzoni Pasta Portions rotelle. Now I can't wait until tomorrow night so I can have the leftovers!! YUMMY!!! Would panko be a good substitute for the bread crumbs? 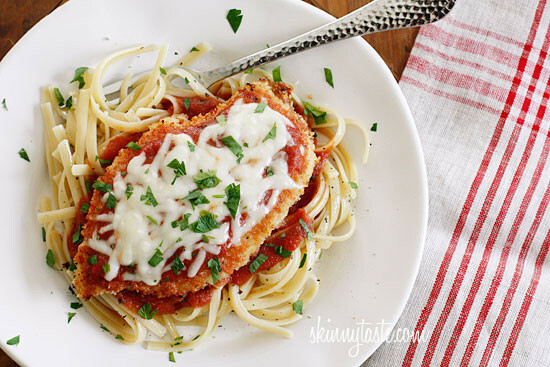 Oh my gosh, this recipe was so good, it was even better than other 'non-skinny' chicken parmesan recipes I have tried. Can't wait to cook it for other people. I made this for dinner tonight. We all loved it! What a great way to get the most out of a chicken breast. Thanks! Thank you Gina for your wonderful recipes! I have lost almost 50 lbs and am at goal. Finding good recipes that I can make for my entire family (5 kids) is essential! I love how you don't go full-on diet food at the expense of taste, a little butter and some good seasonings go a long way and you don't feel like you are dieting. I'm making this tonight, and serving it with roasted spaghetti squash and green salad. Yum! Made this for dinner last night, and it was really good! Only thing I did differently was that I lightly seasoned my chicken with kosher salt, garlic powder, and a pepper before putting the butter on. I used Smart Balance spread too. Excellent recipe! Thanks! I made this for dinner tonight and it was so yummy! Even a 3 and 4 year old ate it up! I made this tonight for my family and it was awesome!.. I love how easy it was; I did spoon quite a bit more than suggested for the sauce and cheese but we weren't trying to go skimpy. Thanks for the recipe! 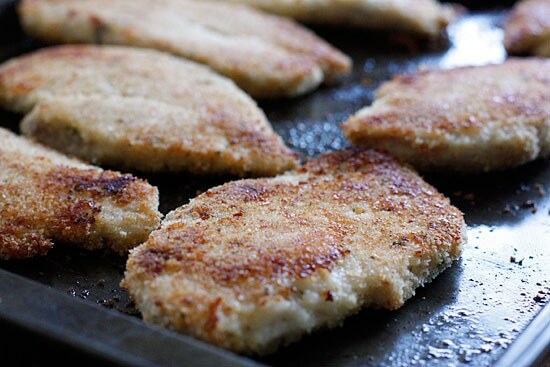 When you freeze these–do you do it when they are already cooked or when they are uncooked and breaded? I have made this about a dozen times since it first appeared on your site in 2009 and it always turns out deliciously. The only change I make is that I use half regular bread crumbs and half panko for that extra CRRRRUNCH. Perfect with a side of broccoli and grilled garlic bread. I just made this about an hour ago and my parents and brother enjoyed this. Chicken parm is my hubby's favorite! After a bad week, I decided to make this for him to cheer him up. HE LOVED IT! The entire meal he complimented me and said it was better than Olive Garden. Classy pallet 🙂 Thank you for a healthy and delish recipe. This will go in our rotation for sure!! I made this last night. It was wonderful.,. I love using the butter rather than the egg as it kept the breadcrumbs stuck better, and they crisped up nicer as well! Just made this for my husband and I who are on Weight Watchers. We both loved it! We had all the ingredients on hand which worked out nicely. Thanks for another delicious recipe! The calorie count noted on this recipe is BOGUS!!! I plug everything into MyFitnessPal and it gave me a count of almost 800 cals a serving. I tried skinnying it up by taking off the butter and replacing it with egg whites, but that only knocked it down to 581 calories per serving. If you're trying to watch your calorie intake, you better be careful on this site. SparkRecipes is much more trustworthy! You're doing something very wrong if you are getting 800 calories per piece! I went back to the analysis and it's still under 250 calories. Checked it on Sparks, and got the same thing, so not sure what you did wrong but yes, it's always smart to double check the info as human error happens. Luckily, the kind people who visit here usually email me if they see a mistake. I am new to eating healthy and have just begun my weight loss journey. my biggest stresser has been "What do i eat now? 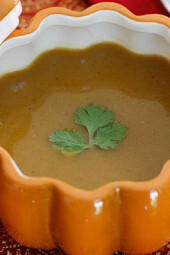 a friend of mine told me about your blog and i found this recipe. this dish was amazing and in no way disappoint! it felt like i ordered Olive Garden to go! I paired it with a side salad and smart taste spaghetti and it was a huge hit with my family. This is something that I will be making again and again. thank you so much for helping make this journey so much more of a no brainer. Gina…this is AMAZING!!! My husband likes my healthy cooking but secretly wants the unhealthy stuff…with this dish he only wanted more, more, more. Soooo GOOOD! Thank you! GINA!!!! This is an AMAZING recipe! My husband likes my healthy cooking but secretly wants the unhealthy stuff 🙂 With this dish…he only wanted more, more, more!!! Absolutely delicious…thank you!! Oh my gosh, I have made this several times now, according to your directions. I don't miss the oil at all!!! Even with using half a chicken breast, it is so filling and delicious. I eat it with a basil/tomato/mozzarella salad and my husband has it on top of spaghetti. Seriously, Gina, you are the reason my husband and I eat so well every day. Every time I cook a recipe of yours, I post about it on facebook and let everyone know about your site. 😀 You rock. Any changes that need to be made to the baking time if I switch to pork vs chicken? I made this over the weekend using all-natural Panko breadcrumps (which made it very crispy) and egg whites instead of butter. Turned out great. Thanks for sharing! I served it with spaghetti squash and roasted asparagus. This was so easy and delicious! My husband and I loved it! Definitely going into the recipe repertoire! Thank you great blog! just made these.They are amazing.Will be making them again. This was sooo good & so easy! I made the marinara & chicken Parmesan! Thanks Gina for posting the easiest recipes that also taste amazing! 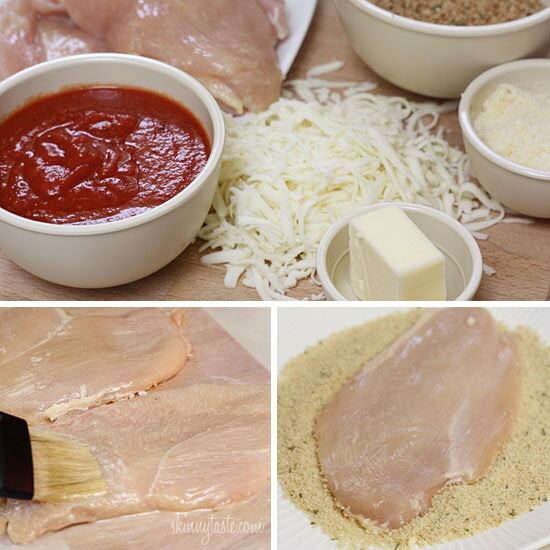 Just came across your site while looking for a lowfat chicken parm recipe – made yours last night and it was amazing! Can't wait to try more of your recipes, this site is just what I've been looking for. 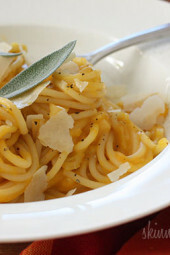 just made this for dinner tonight and my Italian averse fiance even enjoyed it! I will definitely add this recipe to my rotation. Thanks so much Gina! to make this a little more healthy I sautéed green and red bell peppers, snow peas, and some mushrooms and added it to the sauce. I don't use mozzarella since my boyfriend is lactose intolerant, but I do mix the parmesan with the bread crumbs. just don't tell him. we LOVED it. Have you made this yet? If not, don't wait! Make it now! After one bite my husband said "you HAVE to put this in the weekly rotation!" And we don't HAVE a weekly rotation. Seriously deelish! I love this recipe, I've made it multiple times and it's always delicious! Just tried the chicken parm tonight for dinner. Absolutely, delish!! Going into my rotation for sure. Thanks for sharing all your wonderful recipes, love them. I made this over spaghetti squash…..orgasmic!! just made this the other night and it was delicious. It's quick and easy too. I made this today! It was delicious! I love how healthy and easy your recipes are. Thank you! I love this recepie! My girlfriend and I make it weekly! 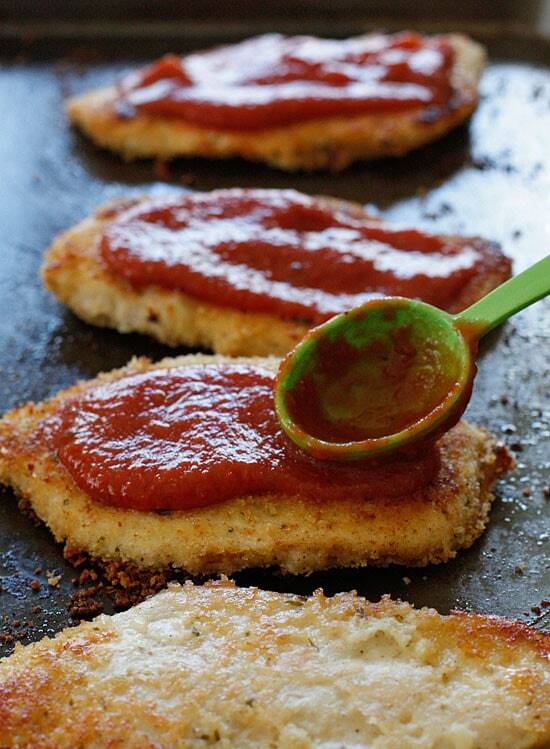 I've made several baked chicken parm recipes and this one is by far my favorite. I've made it twice in the last week and it's everyone's favorite. Thanks so much for sharing. I've started WW and your blog has been wonderful. 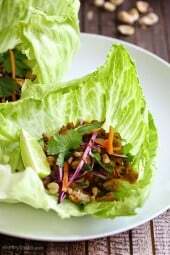 I have bookmarked a ton of other recipes from your site as well! I'm sorry if this has been asked already, but I was wondering if the points include the pasta? I am assuming not, but I just wanted to be sure. I plan on making this tonight! Yum! I just made this. Easy and soooo good! made this a month or so ago. it was delicious! my husband said he preferred this than going to an italian restaurant! score! thanks Gina 😀 use your recipes all the time! This was AH-MAZING!!! It was a hit with everyone in my family, including my Italian husband who loves the sauce/cheeseyness of regular higher fat version! Noone could believe it was 'skinny'! Thank you. Can't wait to make it again. I will also be making this type of chicken without the parm. part because my son (8) really liked it! Thank you! Couldn't believe it was only 6 points–wow! I just tried this tonight, and both of my very picky children (ages 13 and 11) LOVED it, as did I! It was awesome! Thank you so much. This recipe is a definite keeper. When I can get my 13-year old daughter actually asking for seconds, I know something is a winner! This is a favorite of my husband and my kids like it too! In a pinch, I've put 2 slices of whole grain bread in the food processor when I didn't have seasoned bread crumbs on hand. i made this and it is fabulous, i love it, i will definitely make it again. The chicken was so moist. In the process of making this dish tonight, smells amazing 🙂 super easy! Made this for dinner this past week. My husband and two teenaged kids loved it! I'm so thankful for your site…just started with Weight Watchers for the first time in my life at the beginning of the month. Can I ask what kind of pan that is you are baking it on? Made this last night. My husband and two little boys LOVED it! Delicious!!! I made this tonight but put the chicken on french rolls and made chicken parm sandwiches, so so yummy! Thank you! I have made this recipe several times now and it has always been a big hit. It is incredibly delicious!! Thanks for sharing, Gina! Oh my goodness, this is soooooooo good. I LOVE chicken parm, and this is even better than my previous recipe that wasn't nearly as good for you. Seriously, this is restaurant quality. Thanks for the recipe! I'm making this right now. I used panko bread crumbs. The smells coming out of that oven right now are making me giddy! A friend just introduced me to your site and every dinner this week are recipes off your site. 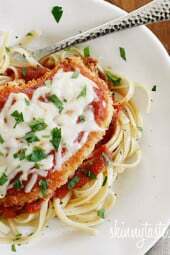 Baked Chicken parm was the first one I tried and my boyfriend and I absolutely loved it. I even cut the chicken quite uneven and still every piece was baked perfect. Thank you!! Tastes like restaurant-quality chicken parm! So good! 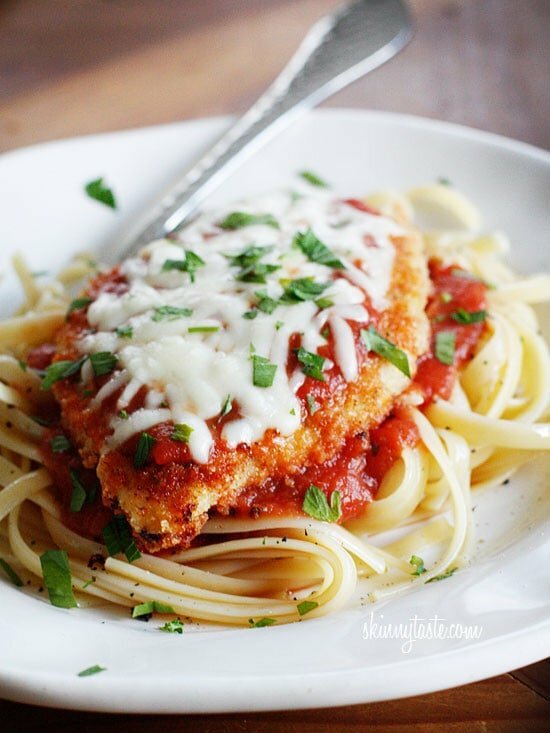 I've made this twice now and would not make chicken parm any other way-true convert here! Love your blog Gina. Stumbled across your recipe when I Google searched one. I was leery about how it would taste being baked with bread crumbs and not fried. BUT…we loved it!! My husband and son are picky eaters and they loved it too!! Phenomenal!!! I bought a box of weight watchers chicken breast that are pre-portioned as 5 oz each. Will I need to cook these a little longer then or do anything else different? Made this tonight for dinner with your marinara sauce.. husband loved it as well as my son.. No Leftovers! So glad there's a healthier version of this dish! This is one of my husband's favourite meal of all times, but the original recipe that I've used adds up to about 20plus points in the WW program! Oy! This is only 6 — so we can have a few more serving per person. 😉 Thanks! I'm new to your site and just made this last night. It came out soooo good, thank you! I'm new to cooking, recently moved in with my boyfriend and trying not to pack on pounds living on his diet (lol) he loved it just as much as I did and i'll now come back to your site for new recipes! This recipe is awesome! Great food without any guilt! My husband and kids have been requesting it weekly! Yum! This was awsome and fast!! I love chicken parm. I would recommend this to anyone reading!! Perfection!! This was soooo good! Ill tell anyone that will listen to try it! I made this last night and it was so so good. Skinnytaste makes it easy to eat real, healthy food even as a student! Just made this for dinner tonight and it was so yummy! My fiance loved it and had no idea it….this will definitely be a staple in our home. This is the most flavorful chicken parm I have ever had. I prefer it over all other recipes and restaurants. I sprinkle my chicken with kosher salt and garlic powder and then tenderize it with a Deni meat tenderizor. Punches the seasoning into the little holes it makes. I also spray my chicken with nonstick spray instead of melted butter. Comes out great. Thank you Gina. Haven't had a recipe of yours yet that was not liked by all. I don't use my cookbooks anymore since I found you. PS: I also top fish fillets with the breading. Very nice. I make extra to have onhand.